← What can theoretical computer science offer biology? Epistasis in fitness graphs of two loci. Arrows point from lower fitness to higher fitness, and AB always has higher fitness than ab. From left to right no epistasis, sign epistasis, reverse sign epistasis. Computer science relies heavily on discrete math and so it is best suited for studying structural rather than statistical features of evolution. As I discussed previously, the central structure of interest for biologists studying fitness landscapes is epistasis of which there are three kinds: magnitude, sign, and reciprocal sign. The latter two can have a qualitative effect on dynamics, while the former can only have a less pronounced quantitative effect. 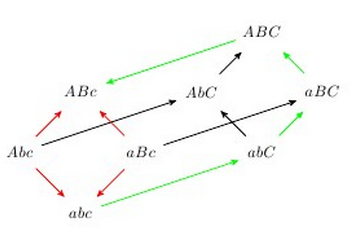 Shortest paths from abc to ABc are blocked by the reciprocal sign epistasis of the red edges. However, an alternative adaptive path exists along the green edges that first introduces the C allele to reach ABC, but then removes it to return to ABc. For example, in a loci pair with sign epistasis: if the second locus is b then the mutation from a to A is not adaptive, but if the second locus is B then the mutation from a to A is adaptive. A system has reciprocal sign epistasis if we have sign epistasis on both loci (Poelwijk et al. 2007). The presence of reciprocal sign epistasis is a necessary but not sufficient (see figure at right) condition for multiple peaks (Poelwijk et al. 2007, 2011). In fact, there is no local property in terms of just reciprocal sign epistasis that is sufficient for the existence of multiple-peaks (Crona et al., 2013) and I conjecture that there is absolutely no local (or polynomial time testable) property that characterizes multiple-peaks. Every subcube of the fitness landscape has a unique fitness peak. There are positive constants such that for all sufficiently large there exists a semi-smooth landscape on such that strong selection weak mutation (SSWM) dynamics starting from a random wild type, with probability at least follows an adaptive path of at least adaptive steps to the fitness peak. If the population is large enough, it will take better steps with higher probability (see Orr’s and Gillespie’s papers). If the population is very large, it will behave almost as a greedy walker (although not quite). My intuition is that if the population takes better steps with higher probability, it will reach the peak much sooner than your theorem 12 suggests. The power of computer science is to show that this intuition is not true. In fact, if we take the limit of extremely large populations and say that the population always selects the fittest adjacent neighbour, then it is even easier to build semi-smooth landscapes where evolution will require an exponential number of steps. Dantzig’s original version of the simplex algorithm, actually followed this infinite population strategy by always picking the best pivot (fittest mutant), and the first time a hardness result was shown was for this pivot rule! In 1972, Klee and Minty (also: Jeroslow 1973) constructed what is now known as the Klee-Minty cube as an example of a hypercube on which Dantzig’s original simplex algorithm would take an exponential number of steps. In fact, if you started at the lowest-fitness vertex and always moved to the fittest neighbour then you would actually visit all vertexes of the hypercube before finding the peak. In biological terms, it means that always selecting the fittest mutant is not better at finding a fitness peak in semi-smooth landscape. Starting at a random vertex on the semi-smooth Klee-Minty cube, it is expected to take adaptive steps. The proof of this is much simpler than Matousek & Szabo’s (2006) for random fitter mutant, but Matousek & Szabo’s constructions is still inspired by the Klee-Minty cube, as are most of the known counter-examples for other simplex pivot rules (Amenta & Ziegler, 1996). Given a selection rule that given a wild type and adjacent fitter mutant selects with probability proportional to for some . There exists a semi-smooth landscape where this selection rule results in an expected number of adaptive steps that is super-polynomial. This conjecture is independent of biology, is true for and , captures Gillespie’s rule for , and seems within reach of current proof techniques in the discrete math literature. Let me know if you know how to prove it! In general, I think that for any population that considers only point-mutants, there are semi-smooth fitness landscapes on which it will not find the fitness peak in any reasonable amount of time. This is the sixth of a series of posts on computational considerations of empirical and theoretical fitness landscapes. 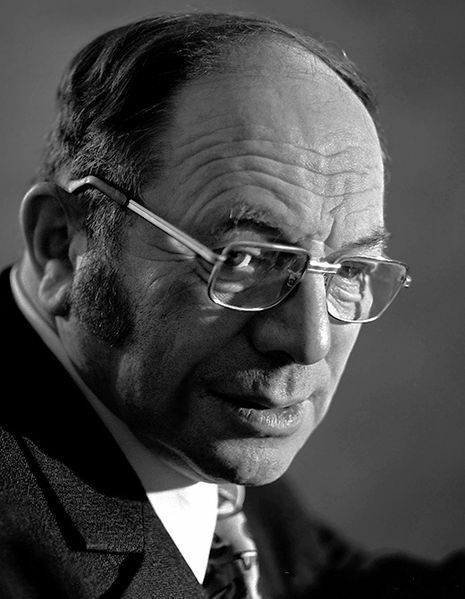 In the previous post I gave a historic overview of fitness landscapes as mental and mathematical metaphors, highlighted our empirical knowledge of them, explained the Orr-Gillespie theory for minimizing statistical assumptions, introduced the NK and block models, and presented an executive summary of the computational complexity of evolutionary equilibria. Amenta, N, & Ziegler, G.M. (1996). Deformed products and maximal shadows of polytopes. Advances in discrete and computational geometry. 10-19. Crona, K., Greene, D., & Barlow, M. (2013). The peaks and geometry of fitness landscapes. Journal of Theoretical Biology. Goldfarb, D. (1994). On the complexity of the simplex algorithm. In Advances in optimization and numerical analysis. Dordrecht, Kluwer. 25-38. Gillespie, J.H. (1983). A simple stochastic gene substitution model. Theor. Pop. Biol. 23: 202-215. Jeroslow, R.G. (1973). The simplex algorithm with the pivot rule of maximizing criterion improvement. Discrete Mathematics 4(4): 367-377. Kaznatcheev, Artem (2013). Complexity of evolutionary equilibria in static fitness landscapes. arXiv preprint arXiv: 1308.5094v1. Klee, V., & Minty, G.J. (1972). How good is the simplex algorithm?. In Shisha, Oved. Inequalities III (Proceedings of the Third Symposium on Inequalities). New York-London: Academic Press. 159–175. Poelwijk, F.J., Kiviet, D.J., Weinreich, D.M., & Tans, S.J. (2007). Empirical fitness landscapes reveal accessible evolutionary paths. Nature 445: 383-386. Poelwijk, F.J., Sorin, T.-N., Kiviet, D.J., Tans, S.J. (2011). Reciprocal sign epistasis is a necessary condition for multi-peaked fitness landscapes. Journal of Theoretical Biology 272: 141-144.